In this article I will cover a repeatable strategy that works quickly and creates results that last over the long term. This system by itself can be turned into a complete business model if you commit to the strategies. Too often marketers will leave monetization as the last step in their planning. They will do the keyword research, generate content, and work blindly hoping their efforts and the traffic they generate will eventually become profitable. I find this to be the exact opposite of what needs to be done, start with a plan to make money, and reverse engineer the rest of it from there. You will save yourself a lot of heartache if you always start with the money. After taking you through all the concepts of making money with video marketing, I will take you by the hand and show you now to create the videos, how to rank the videos, and finally how to land offline clients and sell them leads that your videos generate. SEO has gone through numerous changes over the last few years making it harder and harder to reliably rank content in the search engines and drive steady traffic. Thankfully, many of the hardest changes like the well-known ‘panda’ and ‘penguin’ updates did not affect video content. It is tremendously easier to rank videos using ‘old-school’ SEO than it is to rank regular content. Videos can be ranked in search results almost instantly as opposed to waiting weeks or even months for regular content to rank. There is less competition with video SEO, plus a higher engagement rate with videos than there is with regular content.…Which are you most likely to click on, the big videos or the boring ‘old-school’ content? Videos stand out in search results. They generate more click-throughs and of course more traffic than the regular results that take 10 times as much time and effort to rank. Video is quite simply a no brainer over regular content. The strategies I am about to walk you through in this article and future ones on this blog, can be used successfully to promote affiliate products and earn affiliate commissions. I personally use this system for both, but in my experience there is far more money to be made selling to offline clients than there is in affiliate marketing. When I started out in video marketing, the majority of my income would come from Amazon affiliate products. Simple review videos for high priced products would net me as much s $100 a month in affiliate commissions. Think about it, that’s $100 per video per month! And the best part is that the videos rank as quickly as 30 minutes… with just a few days work creating review videos you could start making $3,000 per month. Let’s say you can make just 5 new videos a day… …And you work nonstop for 6 days. 5 videos a day for 6 days each making $100 per month: 5 X 6 X $100 = $3,000 per month! Now before you run off and start trying to implement this, I want to impress upon you how much more money you could have made if you decided to go the offline route instead. The video marketing method I use for offline businesses is just as simple as ranking affiliate review videos. 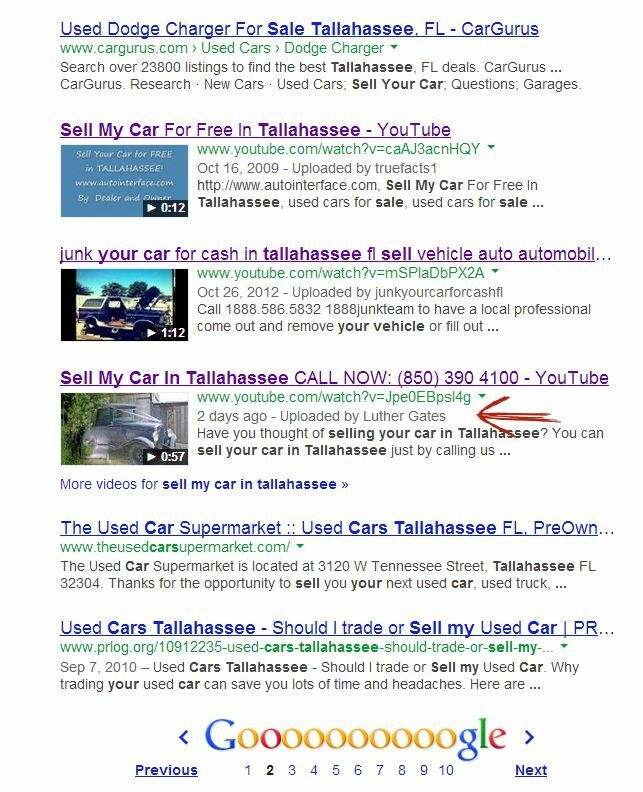 Instead of ranking videos for ‘product keywords’ we rank our videos to capture the search traffic of people looking for particular services and use a call to action to generate offline leads. If you created 5 videos a day for 6 days you’d have 30 videos ranked and generating leads. If each video generates just 5 leads per month, you will have 150 offline leads each and every month ready to be sold to local businesses in your area. At $100 a lead, that’s $15,000 for the same amount of work you would have ONLY made $3,000 in affiliate marketing… …oh yea, and that’s per month every month! So what’s the catch? The only catch here is you will need to spend the time to sell these leads to offline businesses. It does require some extra work but don’t worry… the sale is extremely easy and I will walk you through it though my articles on this blog. Besides, what offline business would say no to fresh new leads? There are many ways to monetize the skill set you are about to learn here. If you already have offline clients, you can charge them flat fees to rank lead generating videos for them. …These lump sums can be as much as $5,000 for a single video! Regardless of the method you choose, you will soon realize how little work it takes it takes to make a full time income selling leads to offline clients. These are the mindset you need to have for being successful on video marketing and especially affiliate marketing. On this blog we will publish different strategies to help you succed from this point on. Follow us for future postings ! 3. The Online Video Battle of Content Vs. Community: Which Rules? This entry was posted in Affiliate, SEO and tagged affiliate marketing, concepts of making money, generate content, how to rank the videos, keyword research, monetization, rank videos, Regular SEO, video marketing, Video SEO. Bookmark the permalink. Follow any comments here with the RSS feed for this post. Post a comment or leave a trackback: Trackback URL.